World Flight 2013: We are losing our patience. 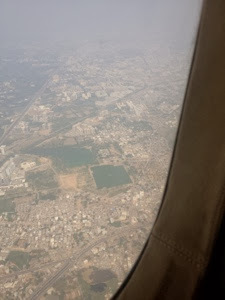 Our first destination today is Ahmedabad, a one hour flight. 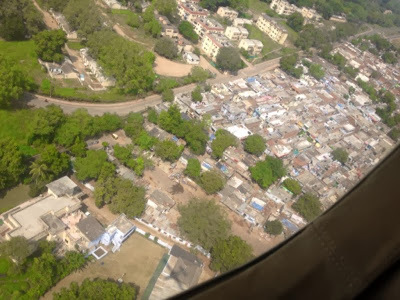 We are flying into Ahmedabad for Immigration Clearance and refuelling and we arrive at 09h10. Now our problem starts: our handling agent awaits us and takes us through domestic arrival procedures, then he takes us through domestic departure procedures and we arrive exactly at the point where we started, a couple of tempers started to rise. (And a couple of fists). What are we doing here? Do you know what you are doing? What is going on? We start walking again, 7 crew and a few handling agents who obviously go through a learning progress on our account. Now we arrive at international departure, the official looks at our passports, finding that we have no Immigration Entry stamp. Now the palaver starts, all Indian heads / handling agents together, their counterpart in Varanasi did not do their job and forgot to have our passport stamped. Now what? 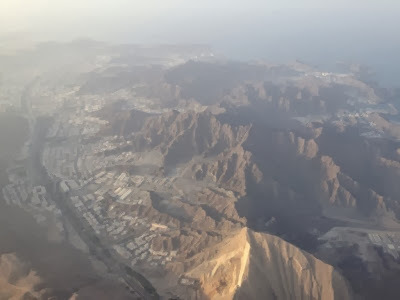 The clock is ticking, we still have a 6 hour flight into Muscat ahead of us, if we have to wait any longer, we run into problems getting into Oman. Eventually the officials agree to stamp us out. Now we think we are ready to go. No way, now we have to go to the tower to do paperwork. Why? What do we pay the agent for? While Dietmar is taken there to get paperwork sorted, I get the plane re-fuelled. By the time he gets back after 55 minutes, once more we think we can leave now. 25 minutes until we get permission to start, to taxi, and now we do stand by for clearance. Present local time 12h35, nearly 3,5 hours after having arrived. My consolation, we can turn our watches back by 1.5 hours. We are still waiting, we are No. 2 for departure. One aircraft in front of us and they are waiting for incoming traffic. By the way - during our approach we had water pouring out of the airconditioner opening, this time on my side, and I look for a towel which we have plenty of. But we really thought that problem had fixed itself... I got soaked. What is that now? Now we take off! 34 Degree C, poor climb performance. Below us a huge town as far as we can see, which is not that far, but still. 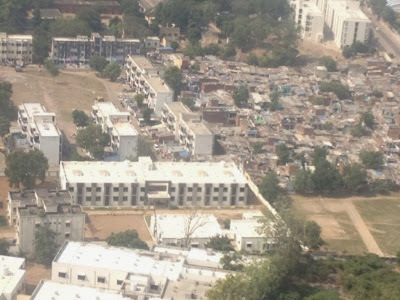 We can see thousands of high-rise buildings, and very densly occupied areas. As mentioned, even this morning we had no view, the air is misty, but there was no industry in the area nor any fires we could see. We must ask a meteorologist to comment on those weather conditions. Now that we have reached our altitude we must eat a bit. We have been in the air 1 1/4 hours and we reach the coastline leaving India and we are above the Arabian Sea. Still 02h49 until our destination. Only water to see. One would expect to see cargo ships or cruisers coming from the Suez Canal, but we see nothing. 01h18 to go, long day today, in the meantime we saw ONE freight ship. No cloud, no turbulances, very calm flight. We hear the first of our group - the JetProp - is on the ground. During the next 30 minutes four more will touch down, we are the second last. ATC / Air Traffic Control is very efficient and proffessional, they give precise and clear instructions in comparison to India and partly Bhutan also. India is a nightmare. 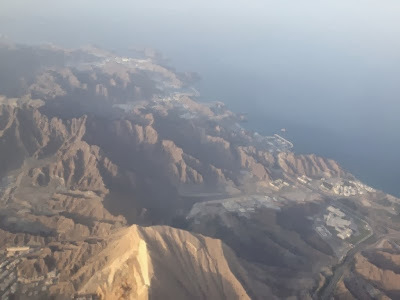 Some pics of Oman as we approach. After landing we refill, secure plane, clear immigration and customs. All works perfect without the Agent Vultures and we call a Taxi for our hotel and then? Not a beer waiting but a journalist from Muscat and he only wants to talk to us because we are still in Uniform; everyone else has showered and changed already, then photos, someone brings us a beer / wine and then we eat. I am so tired, my eye lenses jump out... I go to bed, Dietmar joins the other group for a glass of wine, stays up until a bit later. We sleep long.... Until 06h45 next day. 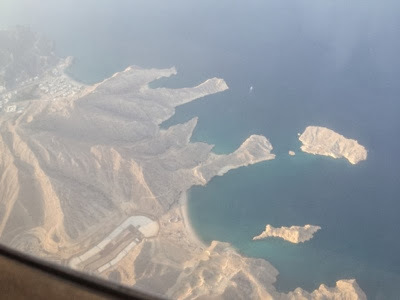 War das der letzte Flug über Wasser? So langsam biegt ihr in die Zielgerade!